Fused Glass Art With Form & Function. Color & Nature Inspired Flair & Sparkle. Amber Bechtol of Natural Curve Creations is a wonderful example of an artist who got her start with traditional techniques, but over time, evolved her own unique style that shows her passion for and dedication to glass art. With over 20 years of experience working with glass, Amber is very skillful with this complex, but also beautiful medium. She really knows how to create pieces that sparkle and shine. One of her signature collections features stained glass suncatchers that she branded Sunflakes. With the help of her husband, she makes these lovely home accents in an array of designs as well as fulfilling custom projects. In recent years, Amber has grown her portfolio to also include fused glass art as well. She imbues the same sense of flair in this work, but is able to create new shapes through the use of a kiln and slumping molds. From bowls and vases to platters and décor, Amber is always exploring what functional items she can make with eye catching forms. 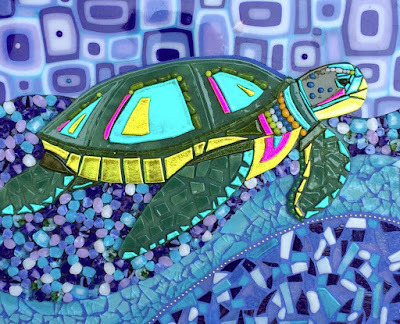 She combines complementary colors and even some pattern or iridescent glass to make pieces pop. Another unique element of her technique is the ability to silkscreen on glass for decorative embellishment. She works with photos or hand drawn designs like her bluebonnets. Amber shows so much skill, but also a willingness to experiment that's allowed her to offer truly unique glass pieces you won't see anywhere else!